"Dysi" is a two-storey house (70 m²) which has the first floor a living room with fireplace, terrace with sea views, full kitchen (with hob, dishwasher and utensils) and WC. Two-storey houses (45 m²) each with living room with fireplace, terrace overlooking the property, fully equipped kitchen, bathroom and bedroom. A tower with ground floor (30 m²) which created a living room with fireplace, a terrace with mountain views and the property, fully equipped kitchen and WC. Upstairs is the bedroom with bath and balcony overlooking the mountains and the sea. 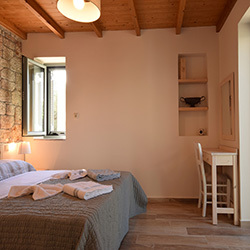 In South Peloponnese, Kardamili in Mani, in an olive grove 7.5 acres, we created four autonomous stone houses, respecting the environment and tradition. The distance from the known beach "Ritsa" with rich pebbles and clear waters, is in 200 meters distance, walking through path with trees and 3 minutes by car. The distance from the village center and supermarkets are 400 meters and we can provide you bicycles for short trips.In the property except olives we produce extra virgin olive oil, we have planted orange trees, lemon trees and keep vegetable garden and areas with animals such as chickens, rabbits and goats. So we can offer to our guests our fresh produce. In residential we use stone, wood and contemporary materials ensuring in this way the ecological character and the energy economy. The outer building with local stone, energy windows, internal thermal and acoustic insulation, solar hot water systems and fireplaces are a sample of the ecological and energy status of 4 houses. There is also a free parking area. 1. A two-storey house (80 m²) which has the first floor a living room with fireplace, terrace with sea views, full kitchen (with hob, dishwasher and utensils) and WC. On the second floor we created two bedrooms with bathroom and terrace with sea view (Messinian Bay) and the mountains (Taygetos). 2. Two-storey houses (45 m²) each with living room with fireplace, terrace overlooking the property, fully equipped kitchen, bathroom and bedroom. 3. 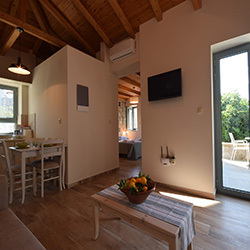 A tower with ground floor (30 m²) which created a living room with fireplace, a terrace with mountain views and the property, fully equipped kitchen and WC. Upstairs is the bedroom with bath and balcony overlooking the mountains and the sea. In the estate's entrance and at a distance from the houses operate discreetly, in the evening, our restaurant the "Kastro". Most materials used for the preparation of our food, produced in the farm eg extra virgin olive oil, vegetables, eggs etc. and if they want our guests we can cook together. 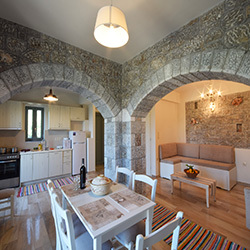 We expect the "Kastro - Kardamyli" to offer unique relaxing and quality holiday in nature. Kardamili is a wonderful, picturesque, historic, coastal village of Messiniaki Mani which is situated 35km southeastern to the city of Kalamata. There, the visitor can admire overgrown mountain sides, olive groves, wonderful beaches, well cared stone mansions of traditional architecture of Mani, verdant gardens and the lovely, picturesque small port.